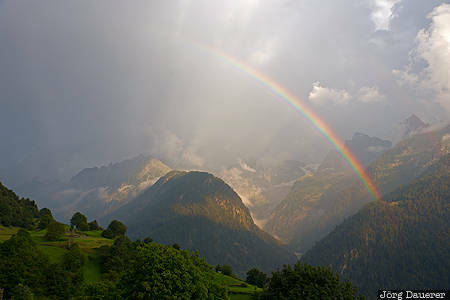 A rainbow over Val Bregaglia (Bergell Valley) after the clouds of a storm are clearing, seen from Soglio. Soglio is in Canton Grisons (Graubünden) in Switzerland. This photo was taken in the evening of a sunny day in August of 2016. This photo is part of the exhibition Rainbow (February 2017). This photo was taken with a digital camera.